Arlecchino, the crafty trickster, always has his head in the clouds. He doesn’t want to do any work or take any responsibility. He would rather pretend he’s an adventurous pirate on the high seas or on a remote island looking for buried treasure. Today he is leading his commedia friends to the Kingdom of Isola del Tesoro to present their play. Unfortunately, he’s lost the map! Now they are lost and only have a few hours to get to the kingdom. 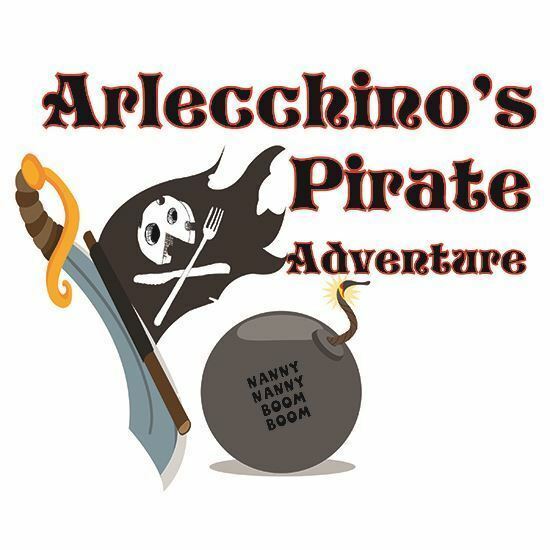 While the company sets up camp for the night, Arlecchino stumbles upon a treasure map to Stromboli Island. Now Pantalone has a new mission – to travel to Stromboli Island and get the treasure. They hire the suspicious Capitano Gorgonzola to take them to Stromboli Island on his ship, the Antipasti. Once onboard, Capitano reveals himself to be a pirate in search of the treasure. After Capitano and his crew mutiny, they take prisoners and steal the map. Now Arlecchino and his friends are in danger and may have to walk the plank. It’s up to Arlecchino to find his courage and save his friends. Approximately 60 minutes. Q:What inspired you to write this play? I like the section after Pantalone has hired Capitano, and they reveal their individual plans. The back and forth and overlap is really fun and crisp. My favorite line is Arlecchino’s response to Capitano about stealing someone else’s naps. Arlecchino say’s, ‘trust me, the only naps I take are my own.’ It’s simple and absurd. I have always enjoyed children’s literature. I directed a version of Treasure Island a number of years ago. I enjoyed the sword play and adventure. It’s also a great coming of age story. I wanted to stay true to the structure of Treasure Island and I found that the characters easily lent themselves to the commedia world. The hardest part was leaving things out. I wanted to stay true to the characteristics of the commedia characters while putting them in to a new adventure. I found that they were incorporated pretty easily into the narrative. Since this is inteaded for an audience of children, I also wanted to include a good moral. Arelcchino learns that he can’t be silly all the time, that he needs to know when to be responsible. At the same time Pantalone learns to forgive and not be so harsh when it comes to dealing with Arlecchino. Forgiveness is an important theme.